There are a total of six tutorials in this learning series. This is the fifth tutorial in the series. Identify and clarify all negotiable issues. Analyze negotiable issues to clarify the value of each. Brainstorm multiple options to address each issue. Assign and quantify total value of each option based on importance and tangible cost. Understand the importance of trading on values, as this will help you avoid conceding. Understanding the Client’s interests behind their positions. 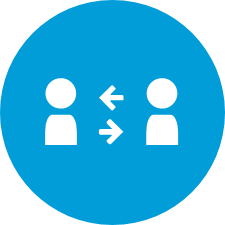 We are now better able to judge negotiable issues that come up in discussion and align them to the relative value placed by the Client. It is important to look at as big a picture as possible before actually trading. 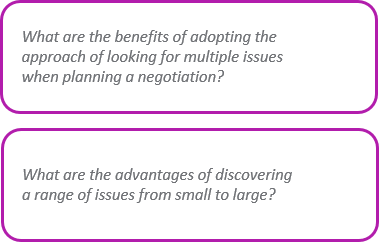 If we focus on only a few issues that we quickly identify without clarifying issues and the values behind them, we may weaken our power to negotiate effectively. Tradable and assigned a value. Click on each question 'i' to reveal the answer. - How can I understand all the Clients issues now so new issues are less likely to be raised later? 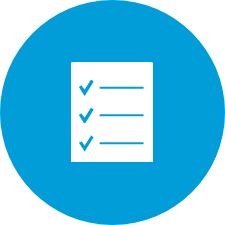 Assign values- Assign values to the issues that will be negotiated. Quantify total value- Quantify total value of issues that will be included in your offering. Without doing these three steps, achieving a collaborative outcome would be pure luck. If you give something up, you should get something of equal or greater value in return. If you ask for something from the Client, you should be prepared to give something to the Client of equal or lesser value. Now you can consider the Creative Options that will address the issues and deliver value for both parties. 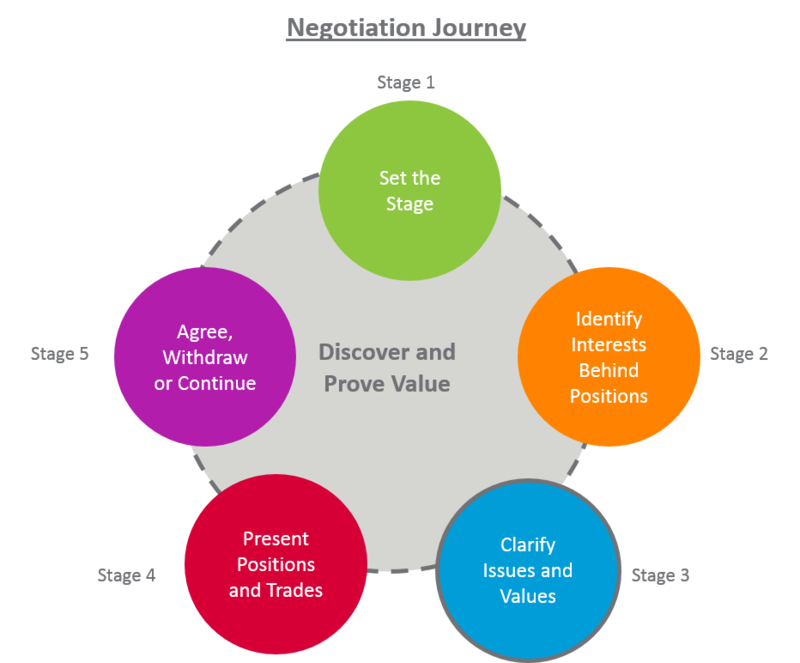 Skilled negotiators use creative options to avoid negotiation deadlock. Effective ways to develop creative options include encouraging different ideas from colleagues within Nielsen. Produce a variety of ideas and don’t evaluate them right away. Increase the number of options available. - Have a list of things that are low cost for you to offer and desirable to the Client and add value. - Offer discounts only for contractual period commitments. - Offer discounts on additional products for additional profits. Read through to learn more about trades and concessions. Something that you provide for which the other party provides something in return. Can be of equal or unequal value. Your goal is to trade one or more issues that are of less value to you for those of greater value. If you set up the idea from the start that if the Client asks for something, they are going to have to trade something, it stimulates the Client’s creativity and forces them to focus on their priorities. You always want to trade instead of concede even if it is something intangible. Concessions: A concession is giving something at the request of another party and not requesting anything in return. For example delivering a category snapshot report to a client free of charge. You set a precedent for future negotiations. You embolden the Client to ask for more. You stimulate them to hold positions, thinking you are going to concede. You erode the very nature of being collaborative. Making concessions by their very nature asks for nothing in return – that doesn't sound like collaboration. At the start to clear up a previous problem, like a late delivery. Be sure to stress what steps you have taken to ensure it does not happen again. At the end to close the deal, being sure that it is positioned as the last step to the agreement. When You Concede: When you concede make it very clear what the cost of that concession is to you even if the Client does not value it. Specify this as a one-time event and not to be assumed for future negotiations. Remember that conceding anything devalues your products/solutions and sets the precedent with the Client that they can ask for something and give nothing in return. Click each quadrant 'i' of the matrix to learn more. 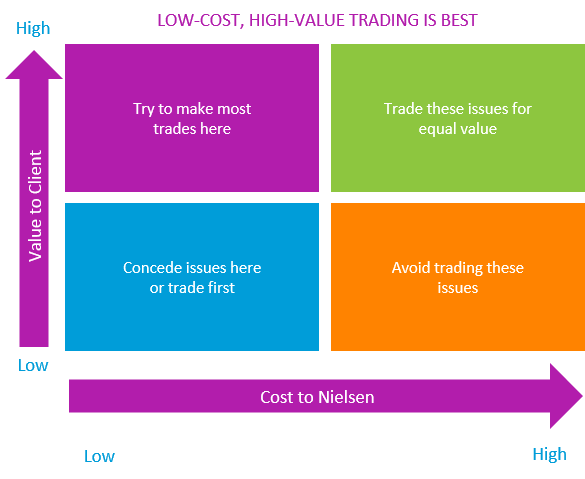 Define value for each issue for both you and the Client, otherwise you can’t plan your trading strategy. 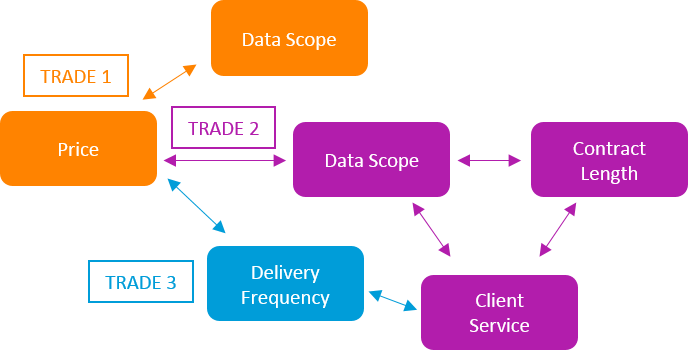 Decide which issues are to be used in combination; for example, I will only lower price if the Client reduces the scope of the data requirements. Search for more issues to increase your ability to maneuver. Then, try to predict what the Client is going to do next and how will you respond. Plan as many moves forward as you need. Click "Trade 1", "Trade 2" and "Trade 3" to see how this trade plan plays out. In your workbook on page 54, think about the case study and capture the negotiable issues and their options. 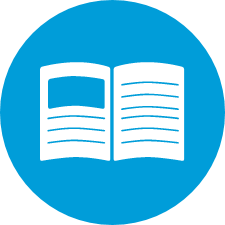 Once you have identified the negotiable issues and options in your Case Study, on page 55 estimate the value of each to Nielsen and the Client. At this stage of the Value Driven Negotiation, Nielsen should be seen as offering a credible solution to their needs and the Client now wants to understand more. The Client is now interested in knowing the details of your solution, including your product and services, and how it is implemented. They will want to know what Nielsen can do to meet their motivations and positions. In parallel, the Client is refining their requirements and positions. Some of this process is independent of you and some as a result of your clarifications and positions. You should therefore expect changes to their requirements. These changes are not a result of what you have done, so don’t be surprised or take offense. There are many moving parts at this stage; for example, things that are happening in the Client’s organization with key influencers and competitors who are trying to get back in with the Client. Clarify what you understand are the Client’s positions and motivations. Focus on getting the Client to prioritize overall what they need as outcomes including specific technical trade-offs. Critical to success is maintaining relationships across influencers at your Client so that you are helping them to meet their objectives through the negotiation. In your workbook, on page 56, is the Negotiation Checklist. Take a few minutes to rate how ready you are to negotiate, in relation to Clarifying Negotiable Issues and Values, with the case study client. What insights have you gained from Clarify Negotiable Issues and Values? How will you determine the value for each option in terms of importance and tangible cost? The next tutorial is the last in this series and will cover Presenting Positions and Trades to Reach Decision (steps 4 & 5 on the Journey). During this tutorial you completed several activities in your workbook. Be sure to save your changes on your local computer. You will use this same file again in the next tutorial.